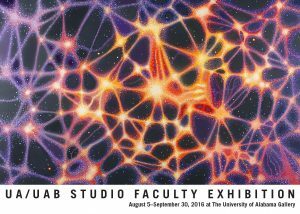 In an unprecedented event, the work of art and art history faculty from The University of Alabama and the University of Alabama at Birmingham will be displayed from Friday, Aug. 5 to Friday, Sept. 30 at the UA Gallery in the Dinah Washington Cultural Arts Center in downtown Tuscaloosa. The public is invited, free of charge, to attend the exhibition and opening reception, which will be held Friday, Sept. 2 from 5 to 8 p.m. in the gallery. 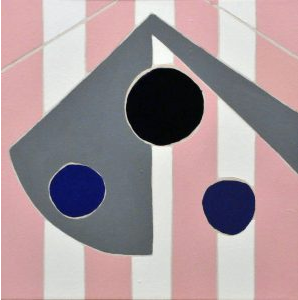 The show will include the work of 22 artists, from printmakers and painters to sculptors and more. Though Wedderspoon doesn’t know whether this exhibit will become an annual event, he said he hopes it will spark more collaborations with other art departments in the area. “We want to be more integrated with the schools in the rest of the state and region,” Wedderspoon said. The University of Alabama Gallery offers a year-round schedule of exhibitions of artistic works, artifacts and textiles and other media from permanent collections held by UA as well as works by faculty, students and guest artists and designers. The gallery is at 620 Greensboro Ave. in downtown Tuscaloosa and is open from 9 a.m. to 5 p.m. Monday through Friday and until 8 p.m. on the first Fridays of the month. For more information, phone the gallery at 205/345-3038 or 205/342-2060. The gallery is part of UA’s College of Arts and Sciences, the University’s largest division and the largest liberal arts college in the state. Students from the College have won numerous national awards including Rhodes and Goldwater scholarships.